But this simple definition got pretty blurry upon closer inspection. First, though non-profit leaders expressed considerable discomfort with commercial marketing jargon (they still do, and for good reasons I’ll get to in a bit), they ultimately embraced the marketing approach to managing their key resource acquisition and mission-fulfillment exchanges. Meanwhile, commercial marketers began to broaden their own definition of marketing — migrating it beyond managing and driving business growth to include advancing a company’s reputation and relationships with a host of stakeholders. Just as in the King Arthur fable, social marketing’s definitional sword became locked in the stone of a conundrum. How could a field advance and find stature if it could not distinguish itself from other approaches? 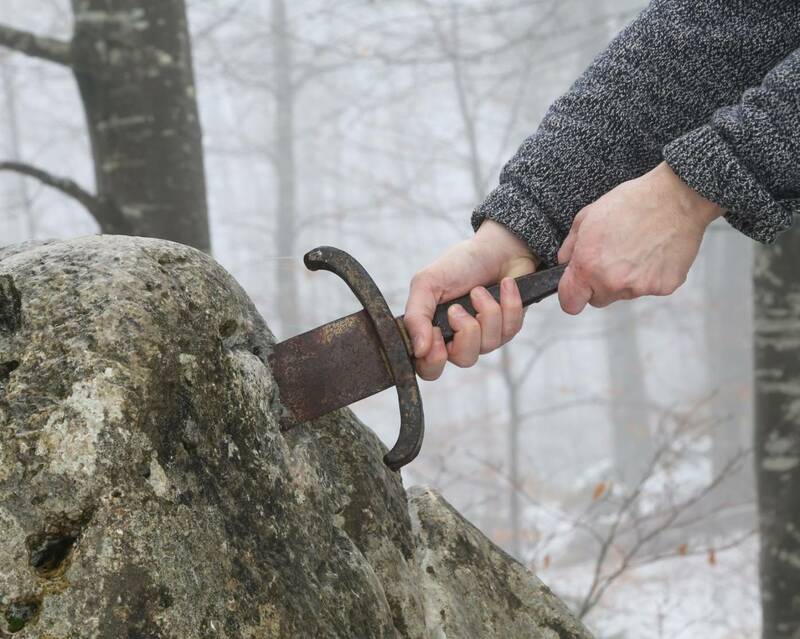 Many a would-be (and worthy) Arthur tried to pull social marketing’s definitional sword from the stone. The three attempts they made at a definition were admirable and, to their lasting credit, illuminated much of our thinking about how to develop great social marketing programs. But, as I’ll explain in a bit, I don’t think they budged the sword. Arthur 1: It’s the Consumer Focus. Some said that what distinguished social marketing from other social change endeavors was social marketing’s focus on the consumer. While other social change agents focused on changing societal norms via rules and policies, social marketers focused on changing consumer behavior (and employing the commercial marketing discipline’s approach to doing so). It was the “marketing” way of approaching social problems. Arthur 2: It’s the Voluntary Behavior Change. A second effort was led by Mike Rothchild, a brilliant social marketing thinker. Mike advanced an elegant perspective that the point of differentiation for social marketing was its unique approach to persuade people to voluntarily change their behavior. According to this formulation, there were “educational” approaches that presented useful information about the benefits of certain behaviors and hoped for the best in terms of behavior change. On the other extreme were policy approaches that coerced change via laws and regulations. We can educate you and hope you change. We can put the arm of the law on you. In between these two extremes we find social marketing — programs to persuade and enable you to voluntarily change your behavior for the better. This definition made social marketing the cool kid in school — the one you’d follow anywhere while you ignored your milquetoast guidance counselor and avoided your assistant principal. Arthur 3: It’s the Product. Other social marketing leaders offered still another view: that the hallmark of social marketing was creating an “offer” — a product that would influence behavior. Essentially, any social marketing effort had to have all of marketing’s “4Ps” to meet the definition. Using Product along with Price, Place and Promotion is what distinguished social marketing from “communication” campaigns, be they of the educational or persuasive variety. Below, I’ll look at why each would-be Arthur has failed to budge the sword. But first, I’ll make clear that I’ll accept no kumbaya definition that makes commercial marketers “at their best” into social marketers — looking to advance the social cause via social benefits their products deliver. Simply put, motivation matters. Yes, commercial marketers must manage and respond to relationships with community leaders, policy makers and many stakeholders. They must exhibit what we call “corporate responsibility” in doing so. But the motivation is to win in the marketplace. The exchange at the very heart of commercial marketing is the exchange of money for products or services. In contrast, social marketing is always about — and only about — changing people’s behavior for the better, period. Many years ago, I managed a multimillion dollar “social marketing” campaign on behalf of a large pharmaceutical company. The campaign’s goal was to reduce the social stigma that inhibited people from seeking treatment for clinical depression. To be clear, I have no doubt that many of the people at the drug company supported the aim of reducing the stigma of depression. But the reason the campaign was developed and funded was to support a “grow-the-market” strategy for antidepressants. Since the company’s product was the first entry in a new class of antidepressants, they got the lion’s share of growth. When the market dynamics changed and growing the market began creating a net advantage for its competitors, the stigma around depression still existed, but the campaign was ended. Again, motivation counts. So to define “social marketing” as a “sub-discipline” that is focused on changing behavior for the better is to blur this fundamental distinction between social and commercial marketing. You can have a fine career in commercial marketing or even teaching marketing to MBA students and never learn a thing about social marketing. Arthur 1. No, it’s not all about consumers. Social marketing should never limit itself to exclusively focus on changing the behavior of consumers. It can and should be applied to changing the behavior of those people — be they bosses, parents or policy makers — who create the social rules and the environments that, in turn, influence the behavior of consumers. A great example is a project I worked on in 2014. The American consumer was being exposed to a whole bunch of “false balance” stories about climate change in the media, making the overwhelming consensus of science look like a lively and unsettled scientific debate. We didn’t try to help consumers understand and resist false balance coverage. Instead, we created the What We Know report that helped change the journalistic norms around climate change coverage. It was social marketing, but the target audience was “upstream” from consumers. Arthur 2. Behavior change campaigns provide information and twist arms. Social marketing cannot be so neatly distinguished from “education” campaigns and more coercive legal/regulatory approaches. Social marketeering is about applying the 4Ps of marketing, including trying to increase the “price” of bad behavior. We can put the scare quotes around price and say we’re just making more salient the “psychological” cost of acting outside of social norms. But why wouldn’t we also apply social marketing approaches to getting policy makers to pass or better enforce laws that increase the price (and psychological deterrence) of bad behavior? For our often-discussed ‘truth’ youth anti-tobacco campaign in Florida, we had no problem helping our young Students Working Against Tobacco teams call out retailers for selling tobacco products to underage teens. As long as it was attacking Big Tobacco, it was on strategy. Arthur 3. Great social marketing campaigns often don’t revolve around a product. Finally, there are simply too many examples of effective behavior change campaigns that had no “product” at their center for them to be downgraded to being something less or different than social marketing campaigns. The ‘truth’ campaign is considered one of the most successful behavior change campaigns ever devised. It’s still going strong 19 years after we created it. We certainly had a “brand,” but the “truth” of Big Tobacco’s targeting of youth was nothing you could buy. There was no “offer,” although social marketers often try to stretch the definition of the ‘truth’ brand (essentially, candor about the truth about the harms of tobacco) to be some kind of product offer. ‘Their brand is lies. Our brand is truth.’ is a great tagline. But there’s no equivalent comparison to “they sell tobacco.” Was it therefore not a “great” or “real” social marketing campaign? The success of the truth campaign is well-established and arguably unparalleled. Would we really want to define it as something other than social marketing? Social marketing is an approach to changing behavior for the better based on creatively harnessing the insights and techniques of three major (and yes, overlapping) disciplines: social science, marketing and communication. I’ve seen the alchemy of these three disciplines coming together too many times to discard any one of them from my definition. Humans have been trying to influence one another since the dawn of civilization (and likely before). These three disciplines distill what we have learned about how influence works. And influence is generally what our clients — mostly governments and NGOs — turn to us for. They typically come to us frustrated. People are not sufficiently engaged in climate change. People are not getting life-saving vaccinations. Young people are becoming addicted to tobacco. Young men are littering up our state. Our clients usually have tried things that didn’t work or didn’t work well. They are a looking for a new approach that can get the job done. And that is where “creatively” comes in. So while I respect, even venerate, our would-be Arthurs, let’s stop putting forward overly simple ways to define our complex enterprise. Let’s instead celebrate the three disciplines that have fueled our accomplishments to date and let them light the way toward a bright future in changing behavior for the good. And let us remember that when it comes to social marketing, clever is king. Dr. Rob Gould is president of One Degree Strategies.